Life rarely goes as planned. But what happens when you're mid-twenties and handed a diagnosis of a chronic invisible illness? What do you do when your life is turned upside down? An honest, open account of learning to live by a new set of rules, this true life story is told with warmth, humour, engaging storytelling and visual style. This inaugural production from White Tree Theatre was initially performed in November 2013 at Friargate Theatre in York as part of Diabetes Awareness Month, with each performance being followed by a Q&A session with the audience. 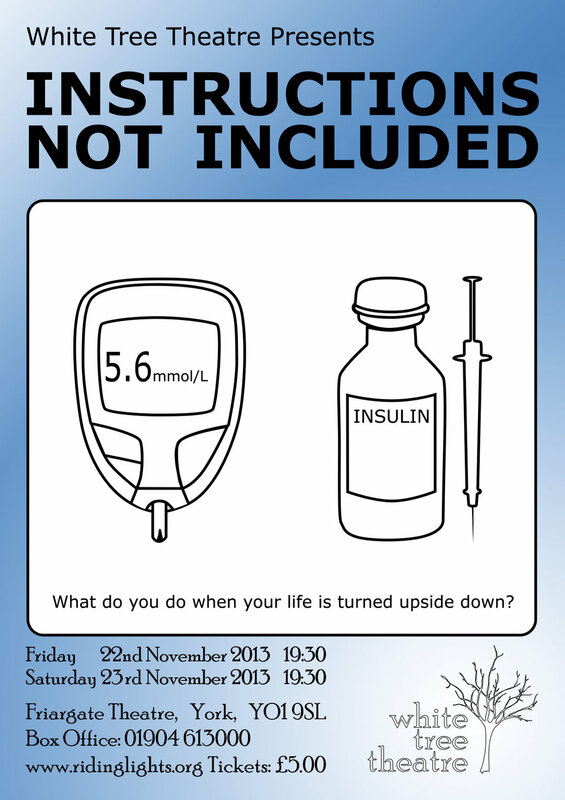 Based on a blog of the same name, this production is a one woman stand-up show meets educational crash course, performed by Rebecca Thomson, Artistic Director of White Tree Theatre, and drawn from her real experiences of being diagnosed with Type One Diabetes unexpectedly at the age of twenty-four. Since the initial two night run, this production has played to medical students at Leeds Medical School on multiple occasions as part of their Health and the Arts programme. Followed by Q&A workshop session, this has been extremely well received. Instructions Not Included can still be booked for your school, community centre, or programmed for your theatre. The performance runs for approximately 30 minutes, and can be followed by a discussion group or workshop. Technical requirements - The performance is extremely adaptable to small spaces, and requires a screen and projector and sound system which a laptop computer can plug in to. There are no special lighting requirements.